Smoking meat is not difficult. Meat smoking is the cooking of meat over indirect heat with hardwoods added for flavoring. See, sounds simple when I put it that way huh? Over the years, smoking of meat has become something of an art form. Different meats, such as chicken, beef, pork, etc., can have the flavor enhanced by different types of wood. Hickory is probably the most popular of the hardwoods used for smoking. Over the last few years, mesquite, pecan, oak, apple, and cherry have come into favor as good smoking woods as well. The experienced cook will often have a favorite wood or combination of woods that he/she prefers to use to create a signature taste. If you’re smoking meat,” low and slow” is the way to go. Try to keep your temperature between 200-225 degrees. Patience is a virtue…for smoking. It takes time. The larger the cut of meat, the longer it takes on the smoker. Some cuts, such as brisket or pork shoulder, can take up to 12 hours on the smoker. Smoking of meat allows the cook time to do other things, as it doesn’t have to be babysat. Grilling requires that the cook stays with the grill and remains focused. Whichever method you choose, ALWAYS remember to let your meat rest at least 10 minutes before serving. Good luck and keep your grill smoking. Want delicious smoked meat without all the fuss? 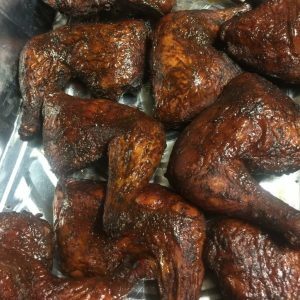 Try Lukes’ Soul Food Cafe’s All Day Hickory Smoked Chicken and be sure to get plenty of homemade BBQ sauce too…Big Mike feeds you right!